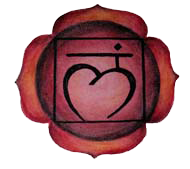 Chakras are energy centers in our body that regulate the flow of energy throughout the meridians allowing energy to be sent to every part. 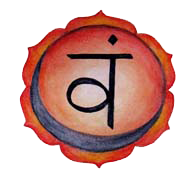 Sometimes chakras become blocked because of stress, emotional or physical problems. If the body’s ‘energy system’ cannot flow freely it is likely that problems will occur. The consequence of irregular energy flow may result in physical illness and discomfort or a sense of being mentally and emotionally out of balance. 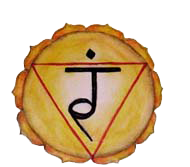 A full day workshop from 10.30am to 5.30pm where you see the three chakras. Founder of Chrysalide France, psychotherapist, coach, holistic healer, speaker, facilitator, trainer, author, Geneviève Prono is a Transformational Catalyst who walks people and organizations through change and transition. She has been helping women and men dealing with life’s difficulties for 27 years and companies going through mergers, crisis or reorganization as well as health professionals, social workers and alternative professionals for 15 years. 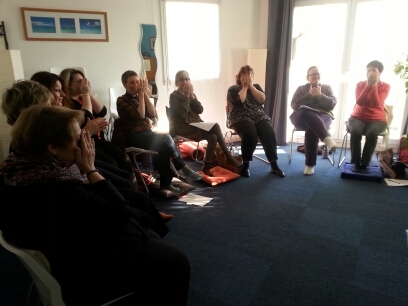 She gives individual , couple and family consultations as well as workshops and seminars. "Thank you, thank you for your workshop and all the tools you gave us ! I didn’t know anything about chakras or energy and didn’t quite know what to expect and I’m really happy I did it. It opened up so many things for me. I feel much better than I have in years. I’ve started using self-massage and Color Perfume, it only takes a few minutes and I feel more energized and happy than before. And I’ve finally stopped procrastinating and I’m working on my project. Thank you ! This means so much to me." Sylvie V.
I wanted to thank you for your kindness and the welcoming and healing atmosphere you create. I was able to understand and integrate a lot of things. You make a great team and the teachings and practice flow very easily. Marie B. It was nice to discover and test new tools and modalities even though I have been in the personal development arena for some years. Great workshop ! Michèle D.
Important : A minimum of 6 to 8 persons is required for the workshop to be profitable for all. Chrysalide France reserves the right de reschedule or cancel a workshop if the minimum number is not obtained. In the last case payment will be refunded. Places are limited to ensure a intimate atmosphere. They will be attributed on a first arrived, first served bases.